Samurai were warriors in the noble class during feudal Japan. They worked directly under daimyos who were large landowners. They were hired to serve and protect daimyos and their property. How powerful daimyos could become totally depended on how many samurais they had, therefore, samurais played a significant role during the period and also were highly regarded. There were also samurais without master, and they were called ronins. Samurais lived with a concept of honor, bravery and loyalty. Although this code was unwritten, it was known by and followed by all samurais during feudal Japan. The code was called bushido. The word, bushido, simply means, the way of the warrior. One of the beliefs bushido empahasised was that dying for their masters was more honorable than to live without showing courage. Samurai armour with a sea shell helmet design. A lot of people in the higher classes, including samurais were strong followers of zen buddism during feudal Japan. The popularity emerged during the Kamakura period. Bushido was also a result of the rising popularity of zen buddhism as they believed its philosophy gave them inner strength during battle and embrace death rather than be afraid of it. Samurais were considered very powerful figures during feudal Japan and, therefore, had a number of privileges over common people. For example, they were allowed to wear two weapons in public, one long and one short sword. This enabled them to display their high social status and gain respect from those in the lower classes. Furthermore, they were allowed to punish or kill anyone who had offended them in anyway. Although it was rare, there were some female samurais. The roles of female samurais differed significantly from male samurais. For instance, it was not very often that female samurais fought in battle. Their roles were seen as more protecting their families, as well as assisting their samurai husbands with taking revenge on his behalf. Typically, weapons that female samurais carried was a smaller dagger or a lighter naginata, opposed to heavy katanas handles by male samurais. As people do in today’s society, samurais wore different clothes for different occasions. 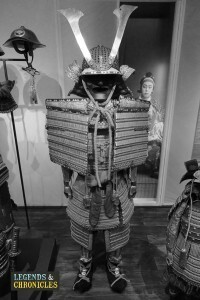 A full suit of samurai armour from the feudal Japan period. During battle, samurais often wore helmets made from iron plates to protect themselves from arrow attacks. 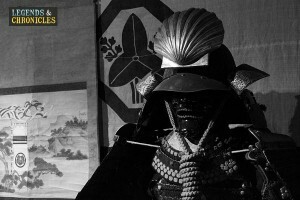 Some samurais wore iron masks for a number of different reasons; to protect their faces and to intimidate the enemies. Samurais also wore iron body suit, which was often colourfully decorated. Typically, they used sharp and heavy samurai swords. It was well known that samurai swords could only be used by those who were truly intelligent and skilled. When not in battle, the way samurais dressed was very similar to how daimyos and shoguns dressed. Samurais typically wore kimonos. There were two different types of kimonos they would wear; summer kimono and winter kimono. During summer samurais wore light silk kimono, whereas in winter, they wore kimonos made of warmer and heavier material. As samurais were in the high noble class, they could wear high quality kimonos. What’s more, this enabled their family members to wear high quality clothes. During feudal Japan, samurais enjoyed being powerful figures, giving them freedom to have total control on those below. However, as Emperor Meiji came in power, he started modernising the society. This meant weakening the power the samurais previously had. For example, they lost their right to punish those who they thought showed disrespect to them, as well as stopping them from carrying weapons in public.